I am hunting the flea market site and having a blast. 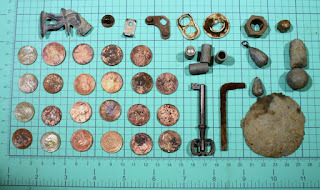 Pictured are my finds from a 3 hour search - I'm not showing the junk nails and other garbage. 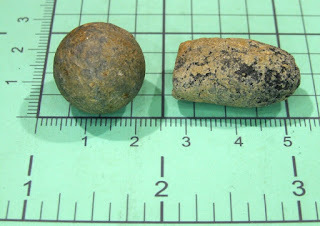 Finds include lead fishing weights, a big "puddle" of lead that go into my lead recycling bin. An old brass key - probably from a piece of furniture. 90 cents in coins today, lots of pennies! Since this is a flea market in Maine if someone drops a quarter they pretty much call out the National Guard to find it, but pennies - no problem! I'm pleased that my skills are to the point where if I dig a hole based on a good signal - I almost always find something interesting. I'm learning to interpret the distinctive audio tones and read the display on my Garrett ACE 300 metal detector. 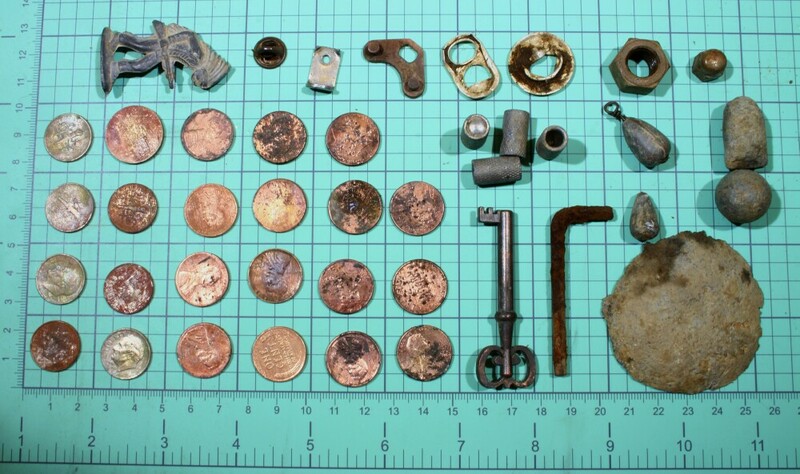 All the items on the top row got me excited because lead, aluminum and brass can ring up like a gold ring. I'm also pleased that I have not nicked anything with my digging tools, I always pinpoint the signal carefully and then dig a plug about 6 to 8" radius. Often the item will be close to the edge of the plug and trapped in the grass roots. 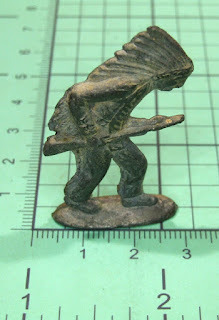 Most finds are less than 2" down, but some are up to 6". And a couple of musket mini balls from the civil war era.